Home » Startup Career » Competitive salary or higher equities if you were to join startup? Competitive salary or higher equities if you were to join startup? Joining a startup is always going to be a tricky decision and it cannot be discounted that the luck plays an important role here. For many experienced professionals, with families and children to care for, it is somehow the conservative point of view that makes a lot of sense as without competitive salary along with a good equity option, joining a startup almost seems like a loss of time. But, then again, that startup might go on to be successful and you might end up losing a big chunk of money. So, the question is that how to decide and what are the parameters that one should consider before joining a startup – is that competitive salary or higher equities. Now, who are we fooling here? Getting a competitive salary at a startup is very difficult and mostly the top brass of the management and the technical team manages to get what they call competitive or higher salary, while most of the other employees have to actually deal with the 10% – 20% cut in the pay they are getting in their current job and there might be other benefit cuts as well. However, that is compensated with the equity option you are offered at startup but then again, you need to evaluate the equity offer you get on a vast range of factors like dilution, taxing, vesting, percentage of outstanding stocks and market valuation and the overall global economy, at least of that sector. One can say that he or she is joining a startup for a learning experience and if that is actually true, one can live with the benefit cuts and lower salary or just below the modest equity option because one does actually learn a lot at the startups. However, money is always one of the major reasons because it is in actuality, the major driving factor at work. Isn’t it? So, it is important to note here that most of the startups have a good eye for potential employees and if you are good at what you do, they will search you and find you. And, when they do, they will start with an offer, by taking their chances, which is not actually attractive. But, if you must know, there is a huge scope for negotiations, which you must do and rest assured that is a common phenomenon. You can actually negotiate on getting a good competitive salary based on how and what you bring and contribute to the company. And, the onus here is on your communication and negotiation skills. If you are banking on equity option, make sure you get a good percentage and do not get flattered by the huge number of common stocks. It only counts if the company is successful at the exit or it’s a total and a massive loss. Always keep in mind. And, the majority of the startups does not meet their set goals and few of them does, becomes Google, if you know what it means and you know now why, luck was mentioned in the very first sentence. The bottom line is that you need not compromise on everything while joining a startup company. Go for either a very good equity option or a competitive salary. If you do not bag either of it, you will just end up being just another guy in the company and will not benefit much when the company becomes a huge success as you won’t have a good equity offer in your belly and the so-called raise in the salary would only seem more disappointing. And, with all that said, one must know that the vesting period normally for the equity is 4 years, as you are not allotted the whole lot altogether but over the period and hence, join with the mindset of staying for 4 years, else you are just wasting your time. 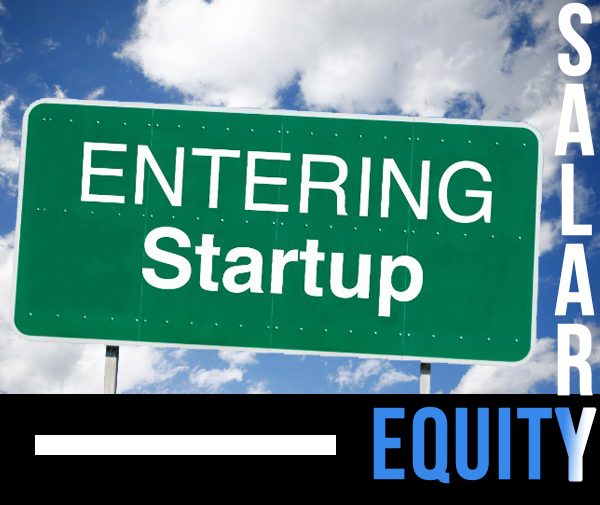 On a personal level, equity option is much preferred by professionals entering the startup companies as that is their one golden chance to hit the jackpot if the company becomes successful. A good percentage of equity can make a person rich overnight when the company is acquired by a giant or goes public and you being on the pilot batch stand a good chance to move up the management as well. And, the reason why higher equity is chosen is because competitive salary can be got at a well-established company as well. Now, you see the point?